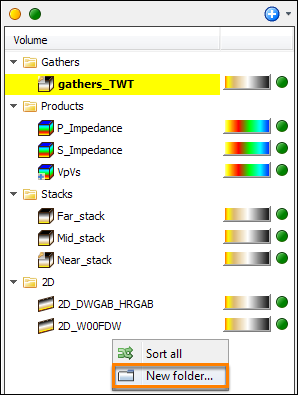 Use folders to organise the Control Panel when working with many objects. 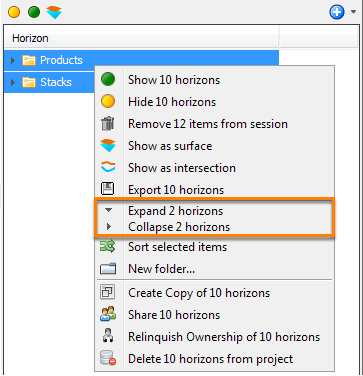 Items and folders can be collapsed, reorganised, and sorted by dragging and dropping, or by using the context menu. When adding items to the session, they are created in their default folder. Any user can move and organise items into folders. This is stored in their session. If the owner of the item changes the organisation, the default folder is updated. This will affect step 1, i.e. anyone adding the item to their session for the first time. In the Control Panel, right-click anywhere to open a context menu. Type a name for the folder in the Create Folder window and click OK.
To change the name of a folder, double click on the folder and type a new name. For more information on how to move items within a folder and between different folders, see Moving an Item. Click the right-arrow icon beside the folder to expand the folder to display the items in the folder. Click the down-arrow icon to collapse the folder to hide the list of items in the folder. Select multiple folders by holding down Ctrl and clicking on the folders. Right-click on the selected folders. 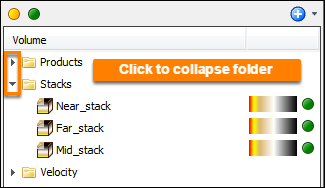 Click Expand/Collapse X items to expand or collapse the selected folders.